A native of California who now makes his home in Portland, Oregon, Furtado took up the banjo at age 12, inspired by the Beverly Hillbillies TV show and a sixth grade music report. He first attracted national attention in 1987, when he won the National Bluegrass Banjo Championship in Winfield, Kansas. Not long after that, Tony opted for the life of a full-time professional musician, joining Laurie Lewis and Grant Street. A second victory at Winfield, in 1991, bookended his years with Grant Street. In 1990, Furtado signed a recording deal with Rounder Records. He recorded six critically acclaimed albums for the label, collaborating with such master musicians as Alison Krauss, Jerry Douglas, Tim O’Brien, Kelly Joe Phelps, Tony Trischka and Tom Adams. Beginning in the late 1990s—influenced by musical heroes Ry Cooder, David Lindley and Taj Mahal—Tony added slide guitar, singing, and songwriting to his musical toolbox and began leading his own band. He especially values the opportunities he has had to tour with A-list artists Gregg Allman, David Lindley, Derek Trucks, Sonny Landreth, and the like. 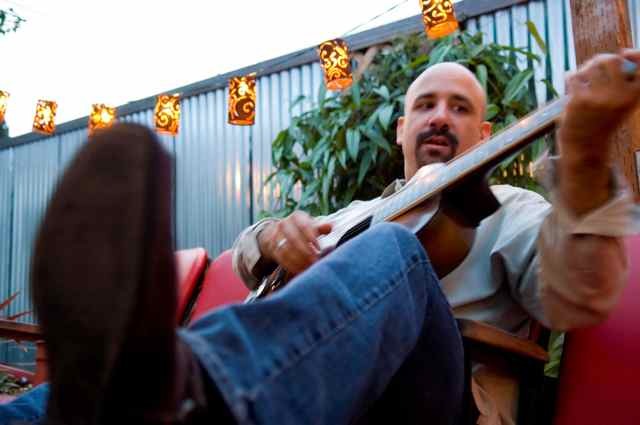 He has performed at such prestigious music festivals as the Telluride Bluegrass Festival, High Sierra Music Festival, Jazz Aspen, Kerrville Folk Festival, Strawberry Music Festival, Winnipeg Folk Festival, Sisters Folk Festival, San Jose Jazz Festival and countless others. Furtado has recorded and produced nearly a dozen records and describes his latest, The Bell, as his most personal. A return to his banjo-playing roots, the original songs explore the loss of his father, the birth of his son, and his own creative rebirth with the move to a new label and management. Most important, this is the first album in a long time on which Tony had complete artistic control. It’s his music, done his way.